Commonwealth Stadium is the name of a stadium in Lexington, Kentucky, USA. This stadium, named for the Commonwealth of Kentucky, is located on the campus of the University Of Kentucky and is the home field for the school's football team, replacing the smaller Stoll Field/McLean Stadium. The field is named C.M. Newton Field in honor of retired UK athletic director and former baseball and basketball player C.M. Newton. Built in 1973, it is the newest football stadium in the Southeastern Conference, as measured by date of original construction. The original capacity for the stadium was 57,800. In Commonwealth's first game, played on September 15, 1973, the Wildcats defeated the Virginia Tech Hokies 31–26, as quarterback Ernie Lewis ran for two touchdowns and threw for another touchdown to lead the Wildcats. The facility currently seats 67,606. In 1999 both ends of the stadium were enclosed and 40 suites were added, 10 in each corner of the stadium. The total cost of the expansion was $27.6 million USD. 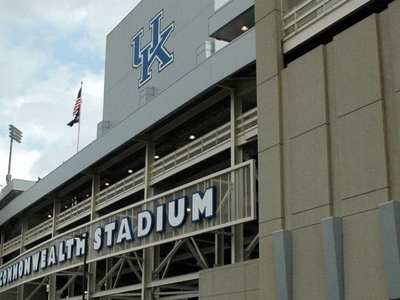 During the 1999 season, Kentucky's average home attendance for football games was 67,756. Attendance for the game against Tennessee that year was 71,022, which remained the record attendance until the Wildcats' 2007 game against Florida drew 71,024. In recent years, crowds of over 70,000 have become very common. Here's the our members favorite photos of "Stadiums in Lexington". Upload your photo of Commonwealth Stadium!